Ready to take your yoga experience to the next level? Join our 200 Hour Yoga Teacher Training. Transform your practice with one-on-one attention from expert yoga teacher trainers in their specific fields. Develop self awareness and yoga teaching skills that translate beyond the mat to everyday life. Receive in depth training on the various topics listed below. Gain lifelong community with warm- hearted, like minded seekers on their yoga path. 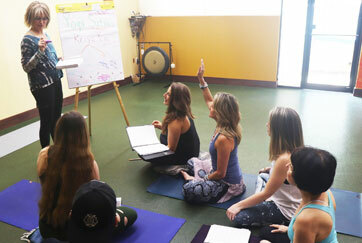 What will you do with Yoga Teacher Training? Gain a method of transformation. Asana: Learn the physical and energetic qualities of postures and how to apply them in teaching students of all different physical abilities and experiences. Learn to teach to the “whole” student. Deepen your practice by deepening your understanding of the structure of the asana as it “lands” in your body. Pranayama: Experience and practice pranayama techniques. Learn how to weave pranayama through an asana class. Love to breathe. Meditation: Introduction to several styles of meditation. Learn how a meditation practice is key to being more conscious. Pratayahara: Practice techniques to manage a highly stimulating world. Train in tested methods of teaching yoga. Gain new skill sets on how to sequence hatha and vinyasa yoga, pranayama and meditation. By the end of training, you will be prepared to teach several styles of yoga. Most trainees resonate with one or two styles. Your mentor will guide you to the best-matched career path or yoga journey. 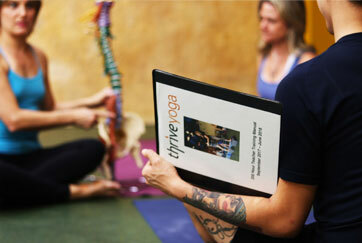 Thrive Yoga’s training is specially designed for you to graduate as well rounded yoga teacher. Gain experience teaching poses and sequences that are interesting and effective. You will train in the anatomy and physiology of the human body and movement. Learn to recognize biomechanics, structure and fluid movement in yourself and your students. The History of Yoga and Lineages – Learn the history of yoga and the philosophy behind the styles practiced in the world. Yoga Sutra Study – Explore yoga philosophy as studied by the ancients while delving into modern interpretation and application of sutra study in life today. The Science and Mystery of Yoga – Learn where fact and science meet philosophy and experience. Explore tools that will help you to integrate yoga into your life. The Brain on Yoga – Learn the latest research on consciousness, and techniques to train the brain for the life you desire. Energetic Body – How is the human body energy? Chakras and vibrational body. Chanting and fun and unique Yoga Techniques rarely taught.